I like my winter porch decor to be easily transitioned from Christmas into generic winter with as little effort as possible. I have enough decor inside the house that needs to be taken down after Christmas, I don’t need to be freezing my bum off outside in the dreaded cold of January doing it too. 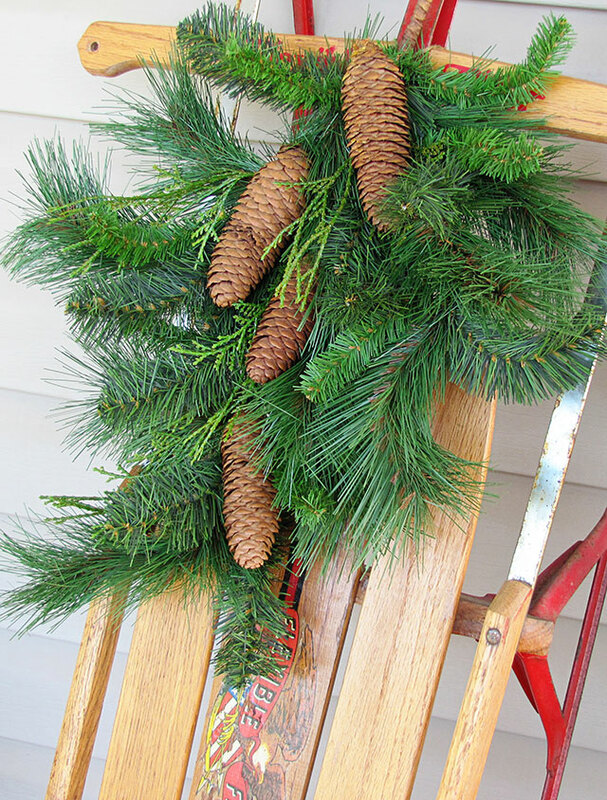 and we’ll take a little tour of my Christmas/winter porch decor. Oh, deer. The deer are staring at us. (My deer friends go back in the garage after Christmas). Or maybe they are staring at my apple wreath that I have had for far too many years. Every year I think I will change it up a little, but every year I end up just fluffing the bow and throwing it on the front door. 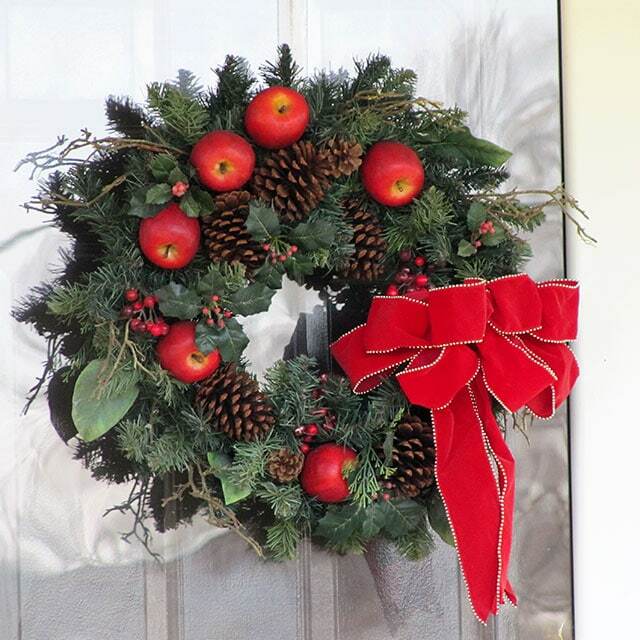 (The wreath stays on the door all winter, I just remove the red ribbon after Christmas). 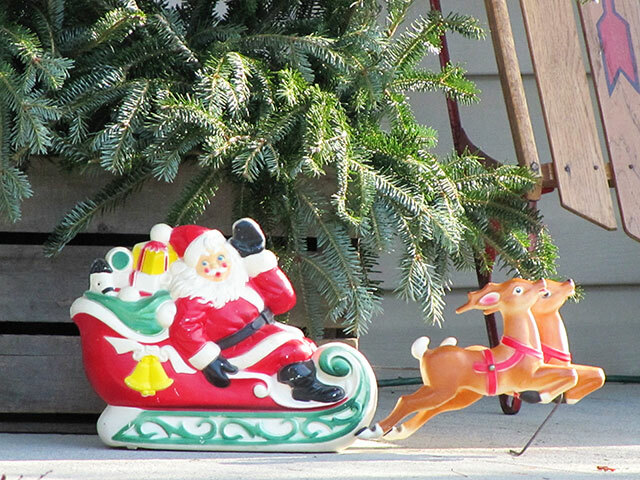 We’re greeted by my miniature blow mold Santa and sleigh that I bought at an antique mall years ago. (Santa is out of here right after Christmas, because we all know Santa takes a vacation in Hawaii as soon as the presents are delivered). You might have noticed my wooden crate full of greenery. I talked about how I got it for FREE at Home Depot a few weeks ago! 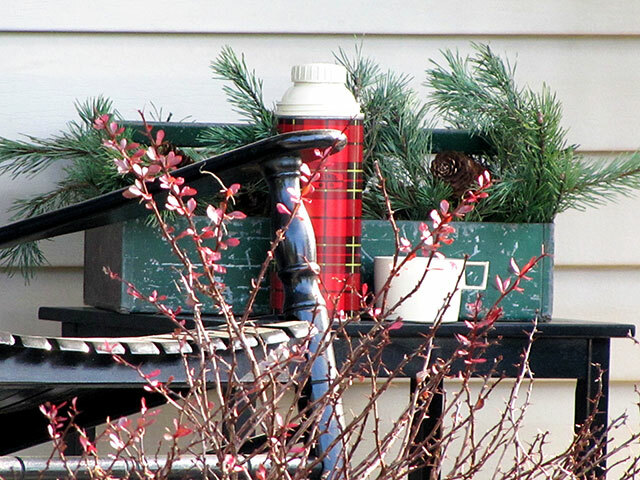 (The crate and greenery will stay there until spring). 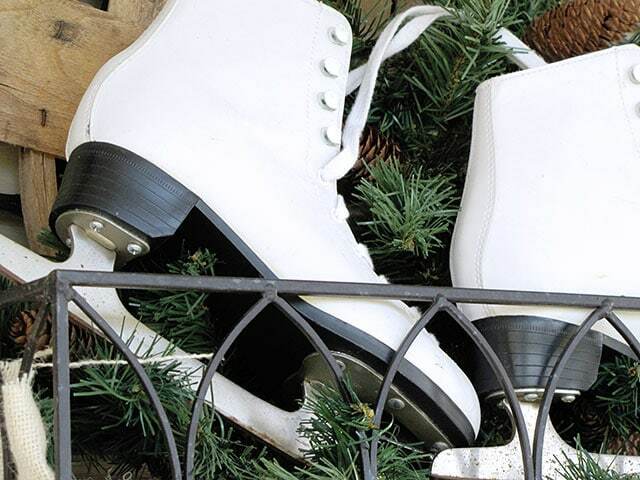 I’ve got an extra pair of skates for you if you’d like to going ice skating on the pond. The pond is about 5 foot round, so no triple Salchows here. 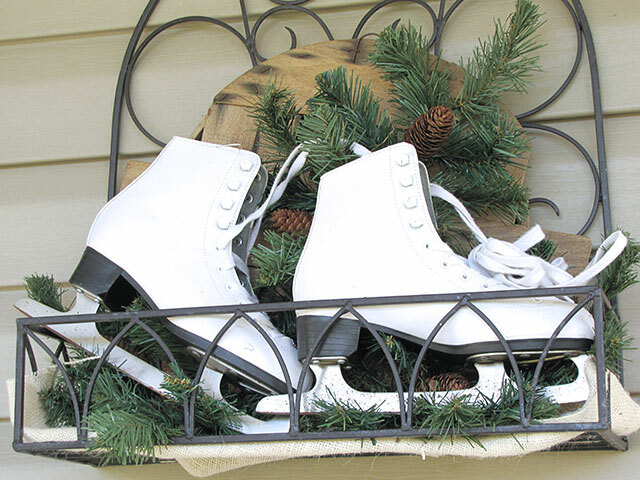 (Skates just say “Hi, it’s winter” to me, so they stay out until I’m ready to put the spring porch decor up). Or if we get hit with a good blizzard, we can go sledding. BTW, this is my Flexible Flyer sled from my childhood. Many a finger were smashed under those red metal runners. Maybe they make the runners red for a reason? To hide blood? 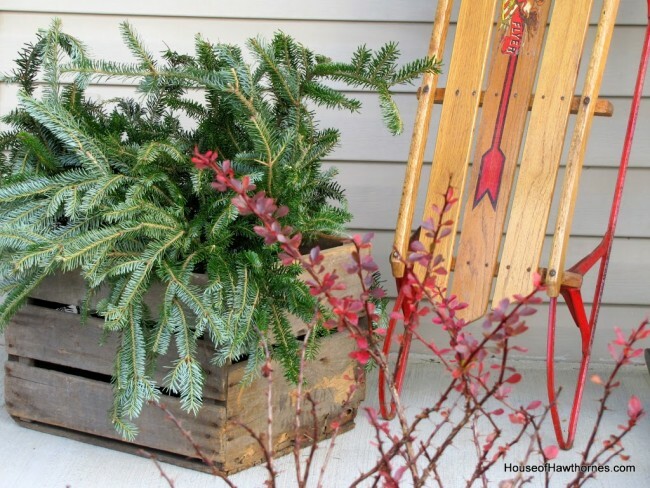 (After Christmas I take the greenery off the sled and it’s still appropriate for the winter porch). Thanks for visiting me. Let’s finish our hot chocolate and get the heck back in the nice warm house! Everything looks lovely! I’ve got a child’s thermos that I put on a bench outside our back door. I think the meter reader guy wonders what it’s doing there. LOVE the bells on your garage. Looks beautiful! I chuckled at the wreath comment….Mine is SO old, but when I mention getting a new one, everybody says no, they like that one!! 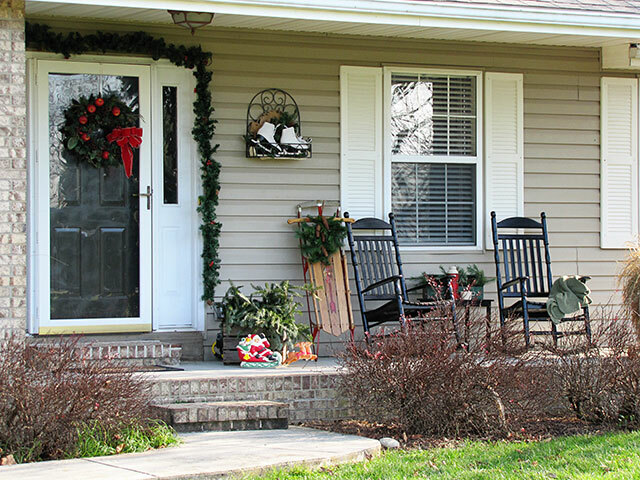 What a festive front porch. You’d never know that you’ve had that wreath for years. It looks wonderful. Love the touch of the ice skates too. 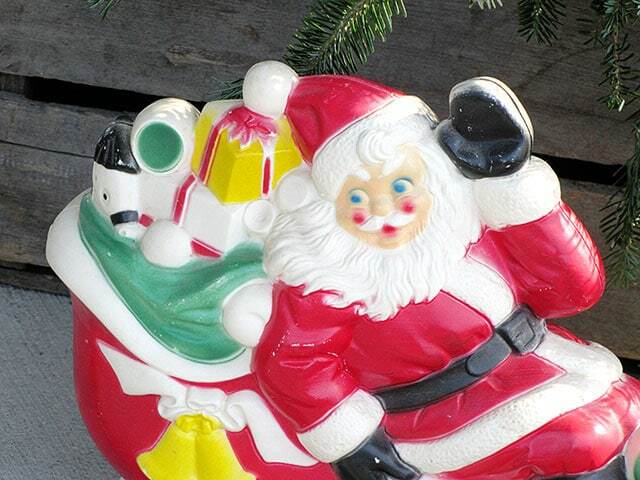 As you can imagine, I’m completely smitten with your blow mold Santa and reindeer. They are just adorable. 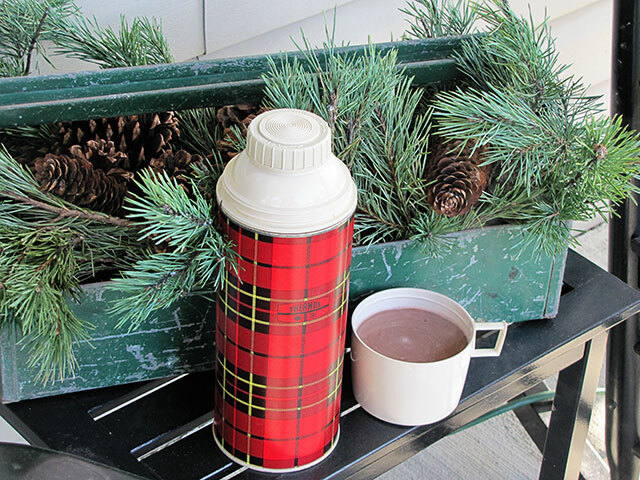 Love that porch Pam and I do like the plaid thermos and vintage Santa mold. Hope you are feeling better. 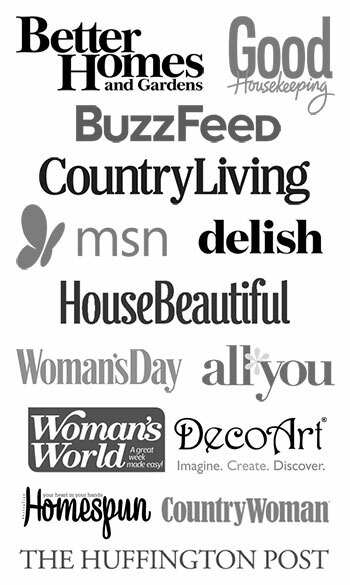 Does your Post say H*O*M*E or what!*!*! 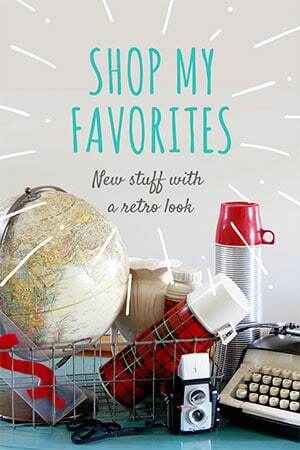 LoVe that thermos & ChiPPy Green Tote the BeSt!!! You have decorated everything very well. I would be delighted to sit with you, wrapped up of course, and have hot chocolate. I pay no attention to the neighbors. Thanks for the hot chocolate. I love your porch, specially the skates tucked in the wall hanger. On my way now Pam! How charming. Love the sled,and of course the hot chocolate was perfect. Do you have any candy canes to stir the hot Chocolate with? If so . . . I’m there. I love a bright, brisk December day. LOL! Your decorations look amazing as always and I’m liking the bells to. They are perfect. Oh- I so enjoyed the hot chocolate while we sat on your porch and everything looks so festive at your house. I love your bells on the garage! I love Its a Wonderful Life- my favorite all time Christmas movie! I hope you had your long johns on. We were 56 here yesterday, but 31 today. I have been going from sunscreen to mittens! Merry Christmas to you and yours, Pam! Have a wonderful time! I would love to sit on your pretty porch and have some hot cocoa with you! Your porch always looks so great! Each season you make it look so inviting. I’ve not commented here before, even though I read daily. Many thanks for your fun writing style….you often make me laugh (the neighbors would think you needed a straight jacket). Happiest of Holidays to you, Pam! I love your front porch. 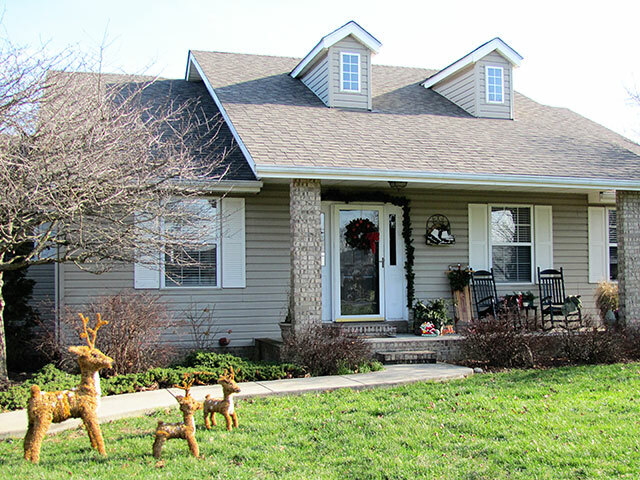 The deer are cute eyeballing that wreath. Very nice. Cute decor and photos. I like how your garage looks! I always love how you decorate your porch. I’m having porch envy. I want one..Maybe, when I purchase my next home. I can so-oo see myself sitting there with you having a cup of hot chocolate. EVERYTHING is BEAUTIFUL. Love the skates and sled. The vintage Santa is sweet. But the real star of the show is that THERMOS. I’m telling you it is way cool. Thanks for the hot chocolate–yum. Your house looks very feative. I love that you decorate your garage. Everything looks very festive. Pam I think your outdoor decorations are great. The bells remind me of my parents home when I was a kid. My mom had red bells in the window that lit up, I think my sister has them now. When we finish our garage and I have lights to hang decorations from I will do so also. Have a wonderful Christmas and enjoy those cute beverages. 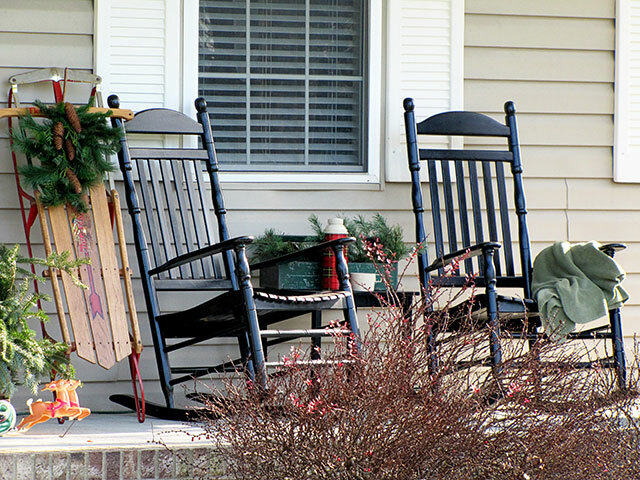 Oh darlin’, your porch makes me just want to grab a cup and sit a spell!!! It’s just wonderfully warm, invitin’ and oh so Christmassy!!! I pulled out our old sled and decorated it on our deck this year. ‘Don’t know why the thought hadn’t hit me before now! Cute! I love your skates and sled. I love your writing style even more—you always crack me up! 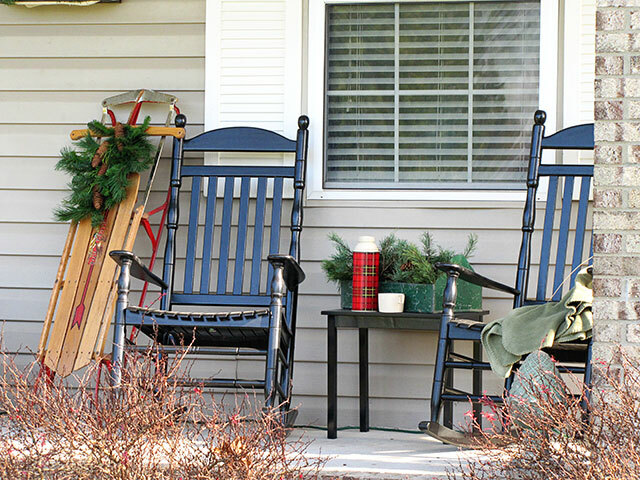 Love your porch, it looks wonderful and cozy! So much fun to revisit past Christmases! The red Thermos is my favorite vignette..